Zoltrog just participated in the draft for Zoltrog's fantasy baseball team. Eleven humans are also involved in what will likely be their very painful demise in the world of fantasy baseball, as well as the world in general. Zoltrog's team will be called All Humans Must Die In A Fiery Holocaust. Yes, I know, it is catchy. 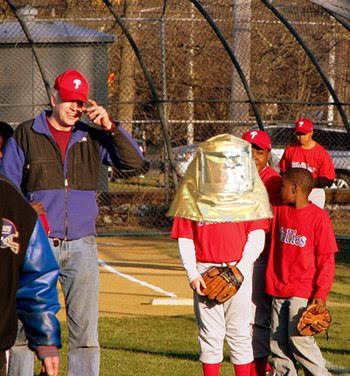 Zoltrog will not engage in games with you, Zoltrog will dominate this base of ball league. Whether by witty strategy or equally witty violence, Zoltrog will reign supreme. Zoltrog's human warriors will wear no identifying marks except that of Zoltrog's own likeness and a single barcode for Zoltrog's own amusement. 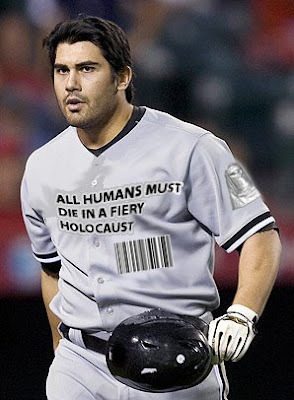 Isn't that right, Human Carlos Quentin, or should Zoltrog say, 8829947479? Mwahahaha! 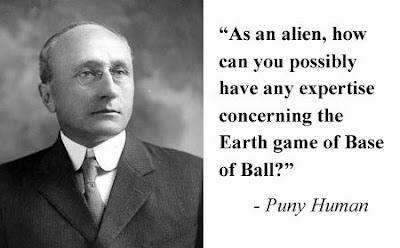 Oh, Puny Human... if only you knew the extent to which your utter puniness negatively affects your ability to comprehend Zoltrog's superiority to that of Puny Human. Zoltrog is currently laughing in 20 languages simultaneously! So do not question Zoltrog's expertise, nor Zoltrog's high percentage of adorability. But do not even entertain thoughts of falling in love with Zoltrog, because Zoltrog cannot be tied down with just one Earth female seed receiver. Zoltrog's figurative wings must remain free to figuratively fly! Zoltrog's fantasy baseball opponents' defenses will be penetrated by Zoltrog, like so many Earth females! But rather than the usual free-flowing onslaught of the viscous genetic seed of Zoltrog's species, Zoltrog will inject a free-flowing onslaught of certain victory! ** Play Base of Ball! ** Zoltrog cannot guarantee that viscous genetic seed will not also be released during victory.